Diamonds are, by definition, crystallines formed of pure carbon. They’re the hardest gem of all and are 58 times harder than anything else in nature. They’re valued for their colorless nature and purity, and most diamonds are over a billion years old. 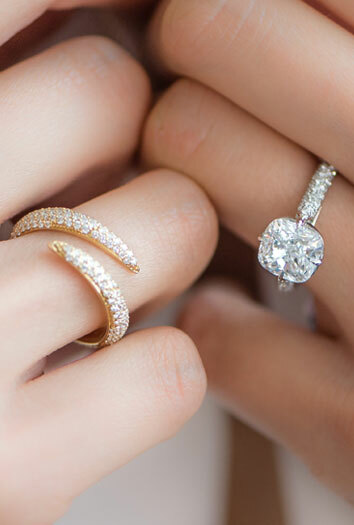 Diamonds have become the paramount symbol of deep, everlasting love. Aside from being April’s birthstone, the diamond marks the 60th and 75th wedding anniversaries, and of course are the most common stone found in engagement rings. Ancient Greeks named the diamond “adamas,” meaning invincible and indestructible. The diamond, in its rarity and beauty, is a symbol of purity and innocence, love and fidelity. Shah & Shah Distinctive is proud to have the largest selection of colorless diamonds in the Washington, D.C. region. Make an appointment today or stop by to view our collection.